The Boss will climb to the top while you fall and die. The Boss will sit while you work like an actual slave. The Boss will use you as an alien 9 iron – really just because he wants to. For years now, and on an increasing basis, “the Boss” has been publicly bashed for his incompetence, heartlessness and misuse of people and their talents. We’ve all seen post after post about the evil, terrible, no good, very bad boss. The role of the direct, day-to-day Manager (or Boss) has been drug through the mud and treated like a despised, yet somehow necessary evil. But, what if I told you that wasn’t true? What if everything you’ve been taught about the big bad boss is – a myth? What if the boss isn’t the untrustworthy, villain we’ve been told he is? When you get down to it the terms Boss and Leader are completely interchangeable in most situations. 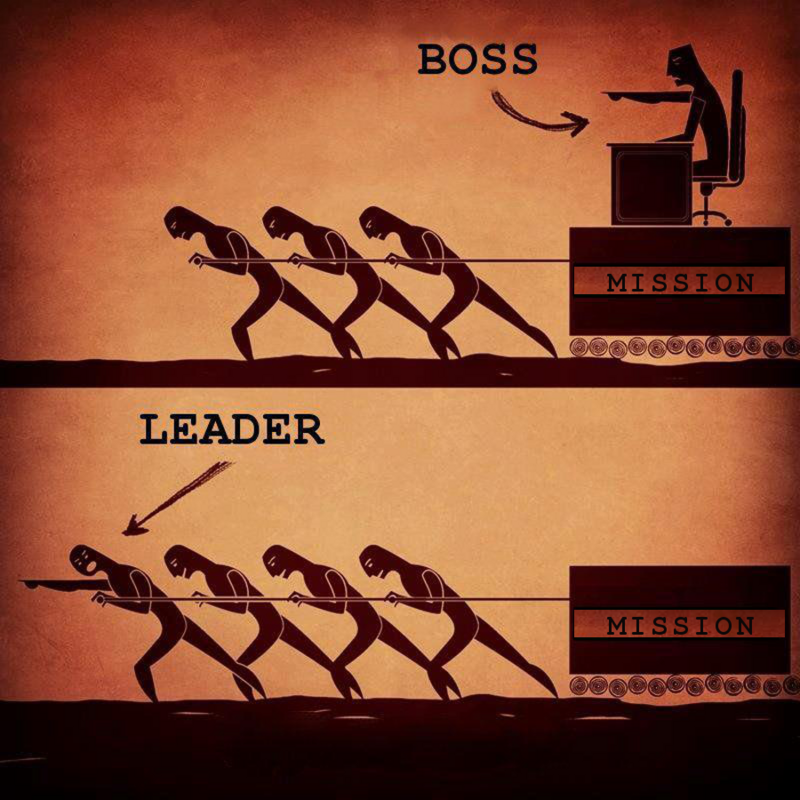 A Boss is simply defined as “a person in charge of a worker or organization” while a Leader is defined as “the person who leads a group or organization.” So you see, they are almost identical. 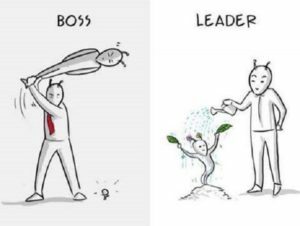 And if we’re honest, those scathing memes don’t actually depict a Boss vs. a Leader but rather a bad example of care vs. a good example of care, a bad example of teamwork vs. a good example of teamwork, and so on. We might as well have a meme called Nice vs. Sweet with one picture of me petting a puppy and the other kicking a puppy. You know what… done. That’s just as ridiculous as perpetuating the hundreds of quotes, pictures and false ideas about two words that, for most uses, mean the same thing. It’s deceptive, it’s misleading and it’s hurting us. Every organization has 1 or 2 Leaders at the helm, at the top, guiding, directing and casting vision. They are out front looking for new territories to take and ideas to launch. Behind them, are dozens, sometimes hundreds, of Managers (or Bosses) who are tasked with utilizing the people and collective resources around them to accomplish the leader’s vision and expand to the new territories. In short – the Leader stands out front and points which way to go while the Boss hands out the maps. One without the other is useless. Either you have a Leader charging the way with no one following her or you have a Boss handing out maps with no destination. They need each other. They don’t need poor versions of each other; they need excellence. For this to work the Leader must know that her Managers (or Bosses) have received the vision and are duplicating it throughout the organization, the Boss must know that his Leader fully supports and is not in competition or feels threatened by him and the people have to believe that their Manager (or Boss) is for them. For years now we’ve adopted this caustic mentality that the person with the best idea should be able to treat people however they want, as long as the organization is successful. We allow genius and ingenuity to give a sweeping pass on care and concern. The largest disconnect is that Leadership is a gift of passion and heart while Management (being an effective Boss) is often a learned skill. That means you can be gifted at one but unskilled at the other. I know successful businessmen, pastors, entrepreneurs, servicemen – who excel at what they do but are some of the worst Managers (or Bosses) I’ve ever known. I know Pastors who can make you feel the fire of God in my bones but can’t feel the disconnect between them and their staff. I know servicemen I would follow into battle but couldn’t lead a peacetime office of personnel if their life depended on it. I know businessmen who are respected in their fields yet fail at gaining simple empathy and sympathy for those around them. These aren’t poor Leadership issues – these are poor Management issues. This isn’t about an unclear vision. It’s about supporting the individual in the midst of supporting the vision. Bad Bosses are the problem. Instead of a mighty crusade to rid the world of “the Boss” we should do what Marcus Buckingham discovered about “Great Managers” in his study conducted by the Gallup Organization. It’s not about playing Checkers where every piece is the same but playing Chess where you must know the abilities and uniqueness of each piece to play and to win. Being a great Manager (or Boss) is about seeing each person as a unique individual (excellence & flaws), finding their strength and applying it to support the goals of the organization. 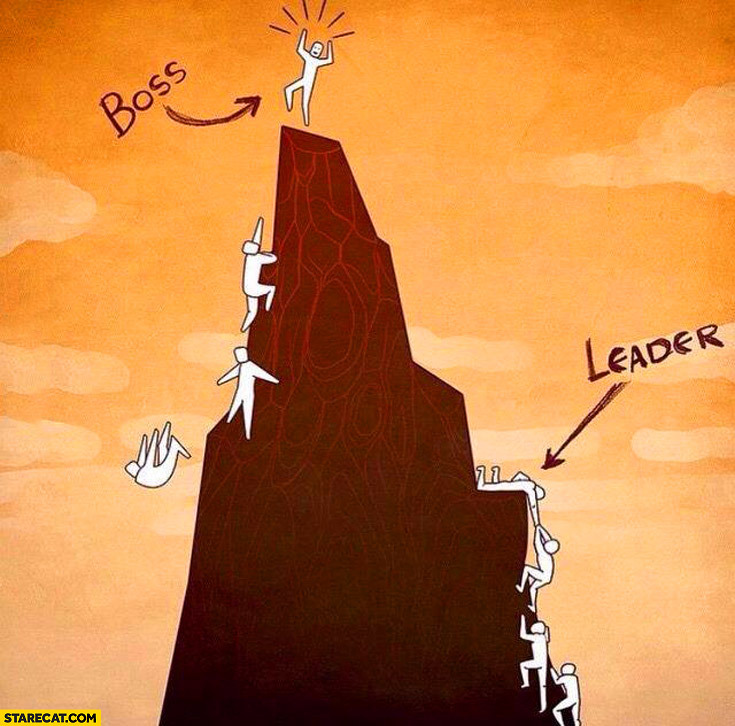 No person who is seen, cared for and supported like an individual ever feels like the sad people on the left side of the Boss vs. Leader meme.